With the economy undergoing a dramatic shift, and predictions for the art world ranging from bad to catastrophic, questions abound regarding the future of contemporary art production and exhibition. Over the next year, a new non-profit arts organization, X, intends to take stock of this extraordinary moment through a series of exhibitions and programming. X will open the first of four phases tomorrow in the Dia Art Foundation's building on West 22nd street, an enormous space which has remained empty for years. Mika Tajima's multimedia installation The Extras will take over the ground floor of the building, while an expansive survey of Derek Jarman's films will be on view on the 2nd, 3rd and 4th floors, and, on the roof, Christian Holstad will show Light Chamber (Part Two). 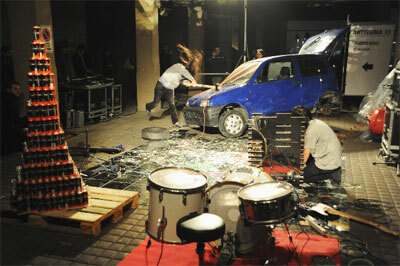 Images: Mika Tajima, The Extras, 2009 (X Initiative, New York, NY, Installation view). Explain the project at X. For this installation, I was thinking about a structure that can be a film set, stage, greenroom, and prop house all at once, creating a site for production instead of a set arrangement for people to look at. 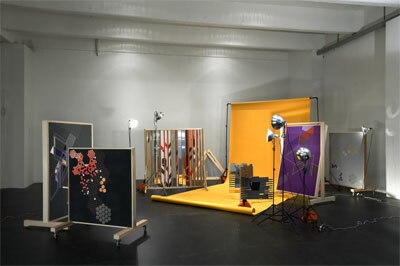 The scene uses the sculptures like "actors," consisting of an ensemble of new and past work, some waiting in the wings, on set, put to task, and others stowed in racks on the side. This setup allows for the running themes from each work to play out in various scenarios. I like using sculptures as support structures for something else, to delineate action and positions of inclusion and exclusion. In this show, the work itself seems almost overtaken by the support and the scaffolding. As much as the elements can be reconfigured, there is also a focus on the direct surface of the objects such as treating them as scenery flats or repurposing them as projection surfaces or bulletin boards. It allows me to redirect formal devices found in painting and sculpture and interior design and architecture, like trying to recast a typecast somehow. As with many of the previous wall-type sculptures, the three new works specifically produced for this project will be layered with printed, abstract architectural patterns - this time of "condemned" building symbols, unfinished luxury condo buildings, and scaffolding patterns. These sculptures will be constructed like tromp l'oeil scenery flats similar to the ones Jacques Tati used in "Playtime". A newly edited video from our Fiat destruction performance in Turin called "Dead by Third Act" will be projected onto set-paper backgrounds. These backdrops will also be the site of a performance by New Humans (my collaborative group) as well as lecture by philosopher Sylvère Lotringer, who will speak about his recent book "Autonomia" on the Italian leftist movement in the late 60s -70s. The title for the project is The Extras. Your work contends with the legacy of Modernism and its imprint on post-industrial production, as evidenced in your consideration of Herman Miller's office furniture designs and the cubicle in The Double and modernist architecture and the factory assemble line in the performance at the original Fiat factory during Artissima. In both projects, one could argue that you counter the idealism of these moments through a sort of destruction, whether that's the distillation of Herman Miller's designs to their barest elements (The Double) or through the demolition of the commodity produced (the Fiat car) by the assembly line (Artissima). I'm wondering if you could talk a little bit about why Modernism is such an enduring topic in your work, and how this might reemerge again in your upcoming project at X. For me it's really about the history of failures and breakdowns embodied by these constructions couched in glass buildings, designer furniture, shiny European cars, condo lofts, "art", etc. Its own contradictions are bursting at the seams and I give it that extra shove. Obviously other breakdowns are happening right in front of us -- the banking system, abandoned construction sites, shoddy buildings, efficiency turned to alienation -- a car wreck. Yet things keep going. I find it weird that even after a hundred years there is still this celebratory atmosphere around Futurism. The legacy of convulsive modernism is really dicey and our Fiat destruction project was thinking about that context: like Marinetti driving his car into a ditch, Fiat factory inspiring Corbusier, noise manifesto, and nationalism, but then turning it on itself. Breaking things to make things. You mentioned that Sylvère Lotringer would give a lecture on the Italian workerists movements in the late 60s-70s during the run of the exhibition. What is the continuing relevance of this movement today, given the backdrop of the current economic crisis? The designer of Herman Miller's Action Office (1968) system described the new workplace as a space to "transact abstractions". We can think about the condition we are facing as part of this continuing abstraction of information, labor, capital, etc. The Autonomia movement was important in identifying this postindustrial transition and linking the legacy of industrial worker struggle to new decentralized strategies to deal with this. How to adapt actions such as no-show, strike, sabotage, etc. and thinking of what position to work from. In my work I think about the possible proxies for this, things operating in ways they're not supposed to. When my group New Humans does these performance type things inserted into the space, maybe the performance is not what people expect or wanted or can even see (maybe we're hidden behind some wall or not even there). And of course, there are the sculptures that are constantly shape-shifting themselves, wall to sound barrier to bulletin board to stand-in, etc. Also for my project at X, it will be mostly comprised of previous works that are being repurposed and reconfigured. It's kind of funny that now some of these works will literally be read as stuff that has to be stored (there will be a storage rack as part of the installation), things that didn't make it in another show or an actor that didn't get the part or the shipping containers piling up in New Jersey.